The RTMotion LCS (Lens Control System) gives you solid, reliable, precision wireless control of cinema and still-camera lenses. The product range is specifically designed to enable a low-cost entry point (single Motor), with a broad expansion capability (FIZ, thumbwheels and more). Unequaled 1.5Km range. FHSS interference immunity. 3x Motor control as standard. Add additional Motors as needed. Simultaneous 4 Axis control as standard (Knob, Slider, A and B), 6 with optional force-joystick. Integral protected antennas to help prevent damage. Precision machined from aerospace grade aluminium billet. Automatic and manual (softstop) calibration. Unique calibration algorithm and torque control to protect lenses. 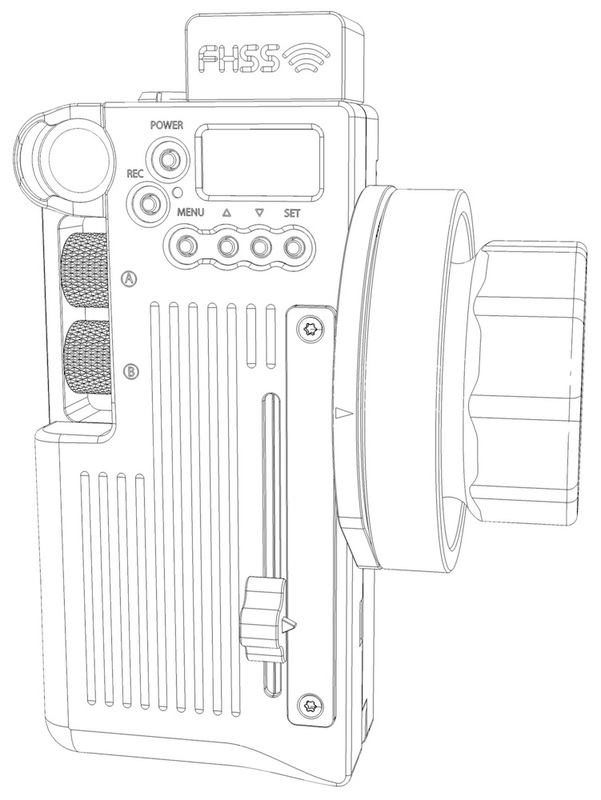 Run-stop support for ARRI, ALEXA, Red EPIC, Red ONE, Sony F55, Phantom Flex, LANC, Blackmagic etc. Our skilled craftsmen hand-assemble and test every single part here in the UK. OLED screen with easy to use menu system. Fluid feel control knob (adjustable). Support for wired-mode operation, for when RF is not allowed (hospitals, etc). Removable Canon LP-E6 battery with 36 continuous hours runtime. 3x 1/4-20 UNC mount points. World's smallest lens control Receiver- 100x32x23mm (inc. antenna cap), 118g. Support for 3x Motors as standard. Auxiliary port for 2x analogue inputs, trigger and digital serial communication. Intelligent camera triggering circuitry: Run-stop support for ARRI, ALEXA, Red EPIC, Red ONE, Sony F55, Phantom Flex, LANC and Blackmagic. 2x 1/4-20 UNC mount points. Fast, accurate, quiet, powerful and smooth. World's first brushless vector drive lens Motor - faster response, smoother, quieter, high resolution encoder, no cogging, no sparking, 4x the service life of brushed motors. Strong, thin and flexible 3mm cables allow for reduced weight, less strain, and easier routing. Support for 15mm/19mm rods, good height adjustment, full range of gears available. Unique adjustable compensation for zero-backlash and perfect accuracy even on worn lenses. Adjustable Motor response for silky smooth to quick and sharp moves. 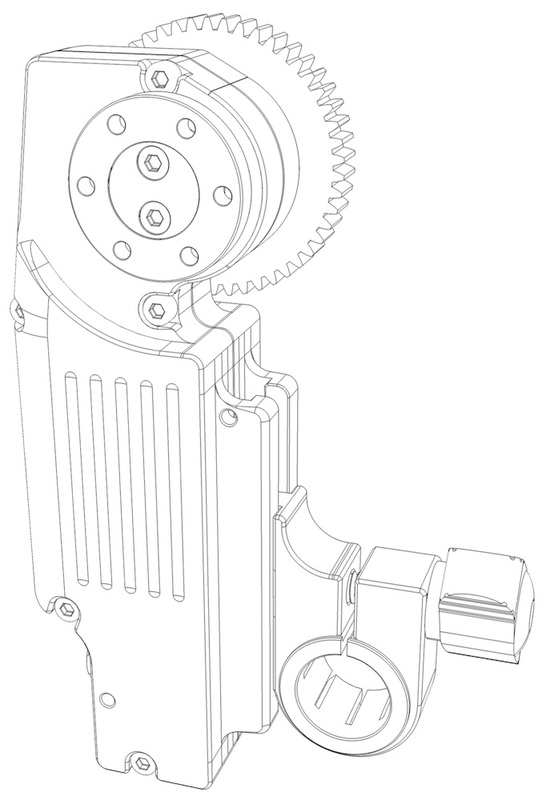 Drive gear can be mounted on either side. RTMotion. Copyright (c) 2009-2017. MADE IN THE UK.